Bob cooked bacon sandwiches as we motored down the Hamble which is probably the best way to start a day in the world and we could see the hundreds of boats milling about over Bramble Bank and towards Cowes. Part 3 – What went wrong? I suspect it will never cease to be an amazing sight. Pete had elected to start us at the ODM end of the start line to reduce traffic and we crossed the line around 90 seconds after the gun. We had left the first reef in which was a very wise call given the wind gusts and a decision taken by pretty much everyone in our class. 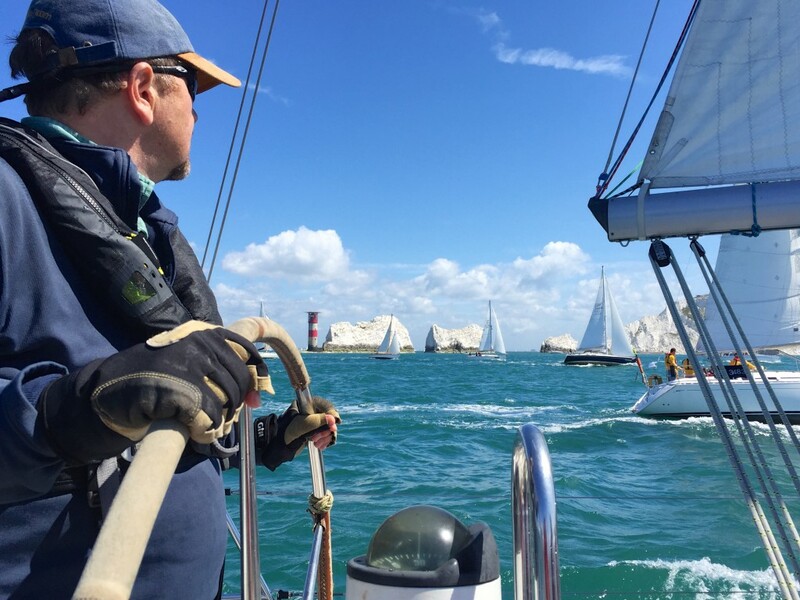 The beat down to the Needles was a lovely sail largely without incident. Twice we tacked into the path of another yacht on starboard and had to immediately tack back – once by I can’t remember who, the other time it was me. Stupid thing to do. As we passed Newtown Creek we shook out the reef as we hadn’t needed to trim the main for a while, we definitely weren’t close to over powered and many others had been. Very smoothly & quickly executed by the crew losing us next to no time I reckon. As we passed Hurst Narrows we were able to force another yacht off our port bow to continue on her line much further than he wanted knowing if he tacked he’d be in trouble as we’d still be on starboard. We were heading to the cliffs but still with 15m depth and there was no way he could call for room. Great fun I thought but eventually I gave in to cries from the crew to put him out of his misery and reminding me we wanted to beat Dignity. 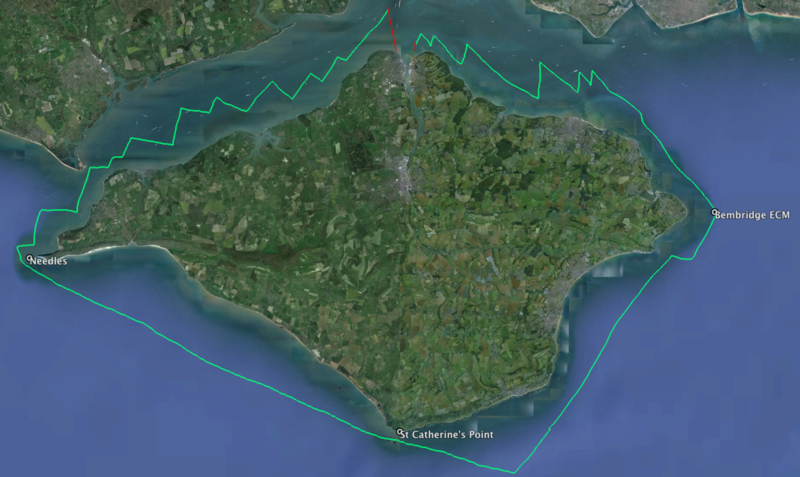 I was lucky enough to be on the helm when we rounded the Needles (a first for me) and concentrated to making sure we were on the safe transit that extends down from the Old Coastguard Station and the Needles lighthouse in order to avoid the Varvassi wreck. We weren’t alone and I missed the actual moment itself. It’s a fabulous feeling and every sailor should helm around that turn. As soon as you turn downwind the feel of the race changes. The boats bunch up and the point of sail on a gently rolling swell is dramatically different to close reaching. Everyone is on the same tack converging on the same mark 13 miles away. I find it far more unnerving than upwind dealing with approaching yachts on different tacks. Hardly anyone was putting up their spinnaker which was very unusual and the wind, at 15-20 knots, was too much for us to attempt it. As we approached St Catherine’s Point the wind was stabilising – still on the limit for the chute at between 13-16 knots but at least it was no longer gusting. 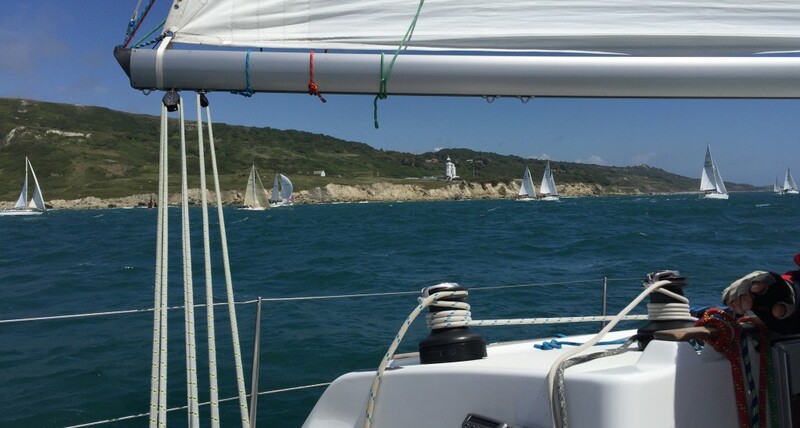 We continued on the same tack for a few more miles ready for a gybe back up towards the next mark at Bembridge. Bob & I rigged and hoisted the chute in its sock, which took some time because we weren’t familiar with it having only last used it a year ago (it was too windy on our training day). As we furled in the headsail it insisted on wrapping in the chute so after several attempts we dropped it, furled the headsail and then re-hoisted. It felt like a long time wasted but in reality we were still on the same point of sail just not benefiting from power in the jib. Finally it was flying and really looked glorious in its colours. We had no idea how much tack line to allow through and so set it around 4-6 feet I would guess. After checking with Jim, this was probably right – we’d need to bring the tack right down to the bowsprit if we were on anything like a close reach. We also had the mainsail right out and the vang full on to power up the main. I’d learnt this at a spinnaker course run by Sailing Logic a few weeks ago. If you don’t then the chute dominates the power and pulls the boat round more as the bow digs into the sea. I’m presuming the same logic applies to a cruising chute as does a spinnaker (anyone care to comment?). There were no yachts around us, we’d sensibly chosen to stay away from others for this phase. But we could see a few behind us making adjustments to steer even clearer away. Very prudent. Of course after a few seconds, the boat was back on track, the chute full and we were all thinking, I reckon, that we should get it down. We were just discussing what we could have done and concluding there was not much when another huge gust hit us. Same again only worse – boom definitely in the water and the chute scraping the water for longer. I’m sure several of us were shouting at the helm to correct for it – out of desperation I’m sure. I was convinced it was going to rip apart in what Pete later told us was around a 25 knots gust. Bob & I went straight up to the bow and the chute came down through the hatch into the forepeak cabin. We weren’t going to make the headland so put a couple of gybes in to get us to Bembridge Ledge. I was back on the helm as the boats converged on the east cardinal buoy and Pete was on the mainsheet. It’s a great feeling as you harden up around that mark, transitioning from a sedate broad reach to close hauled as within seconds you’re amongst a couple of dozen yachts pushing the boat hard. With a full main we were on the verge of being over powered. As soon as I felt the boat taking the power of a gust, Pete was easing the mainsheet and then immediately afterwards trimming it back again. We knew we couldn’t risk being turned into wind with another yacht 20 feet to port so Pete wasn’t clamping off the mainsheet. 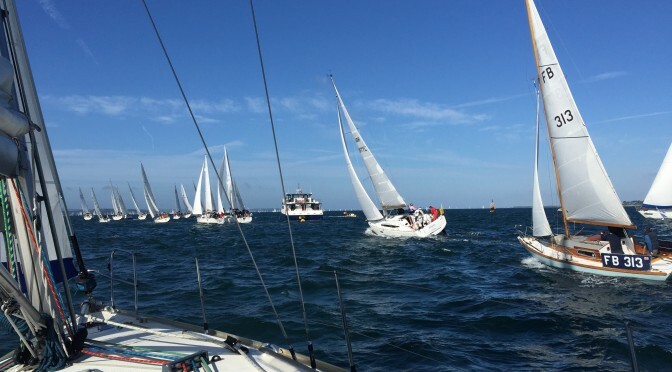 We were on a single tack close hauled for around an hour before the port/starboard tacking battles started on the approach to the finish line. This last phase always takes longer than you realise and hopes of beating our 2012 time faded. Pete took us high above the finish line and we came in to the south gate on a final starboard tack just hoping we’d force someone on port to make another one. Previous PostRound the Island Race Training DayNext PostRound the Island – So what went wrong?